This Qualcomm Snapdragon 808-powered handset can be acquired from AT&T starting at $149.99 USD (with a two-year contract). Just as anticipated, AT&T became today the first wireless carrier in the United States to add the Microsoft Lumia 950 to its portfolio. Online sales have already begun, while the handset will be available in retail stores starting this Friday. For now, the high-end Lumia 950XL still has to find the first carrier to add it to its portfolio, unfortunately. For a limited time, AT&T also offers its customers the chance to buy a Microsoft Surface 3 for $399.99 USD. The offer is only available to those who buy the new Lumia 950. The handset's higlights include a generous 5.2-inch QuadHD OLED display, a powerful Qualcomm Snapdragon 808 SoC, as well as the 20 MP PureView Zeiss main camera that can shoot 4K video. With the Lumia 950 and Windows 10, you can enjoy the Windows experience across your Windows 10 devices. Your files, photos, apps and other media are secure, synced and available with 15GB of free online storage on OneDrive. The smartphone works like a PC if you pair the new Continuum feature with the Microsoft Display Dock HD-500 (sold separately). Just connect a monitor3, keyboard and mouse to the Display Dock and view your Office apps and Outlook on the big screen, while you continue to talk, text and tweet. The Microsoft Lumia 950 also features Cortana,4 your personal smartphone assistant, so you can be more productive by searching online, sending emails and setting reminders and appointments. Cameras: PureView ZEISS rear camera with 20 MP sensor, triple LED Natural Flash and 4K video capture, and a 5MP front-facing camera. Processor: Qualcomm® Snapdragon™ 808 processor combined with 3GB of RAM. Storage: 32GB5 of internal storage memory. You can expand to 200GB using a MicroSD6 card. Display: 5.2-inch QuadHD OLED display. 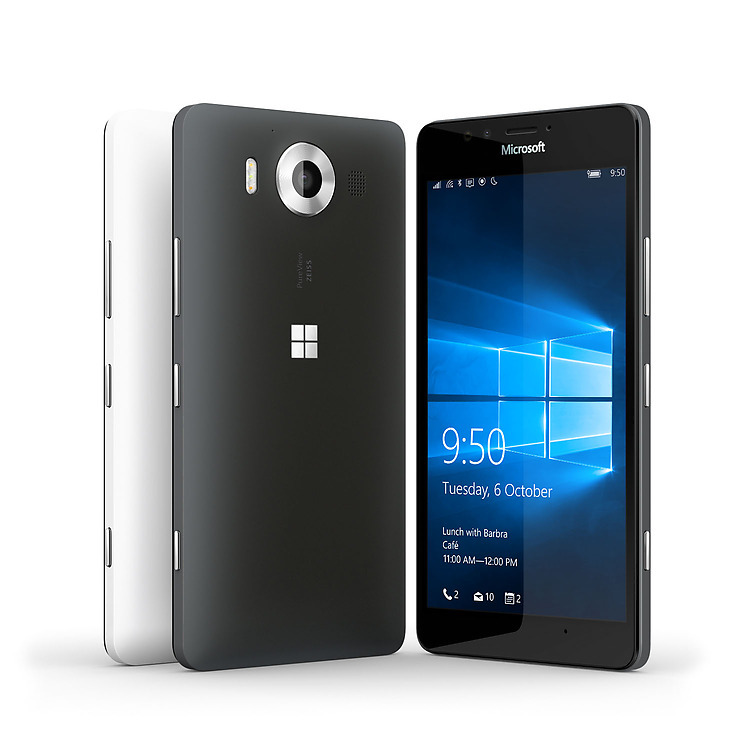 The Microsoft Lumia 950 earned four out of five stars on AT&T’s Eco-Rating 2.0 system. The system rates the social and environmental factors of AT&T branded handset devices and tablets. AT&T created the Eco-Rating 2.0 system to empower consumers to make better informed decisions when selecting a device. For more information about this device’s rating, Eco-Rating 2.0, and how you can join AT&T in making a difference, please visit http://att.com/ecospace. For more information on the Microsoft Lumia 950, check out this Mobile Minute video. You can also visit: att.com/lumia950. Follow the conversation on social using #Lumia950. 4You need a Microsoft® account to use Cortana. This feature is not available in all languages. For information on the supported languages, go to www.windowsphone.com. 5Portion of memory occupied by existing content. 7Applies when charging from 10% capacity; actual results will vary based on usage. 8$0 down with AT&T Next req’s well-qualified credit & a 20-mth, 24-mth or 30-mth 0% APR installment agreement. Down payment option also available. Wireless service (voice & data) is required & is extra. Tax due at sale. If wireless svc is cancelled, device balance due. Other charges & restr’s apply. Visit att.com/next for AT&T Next requirements. 92-yr agmt req’s qual. svc (voice & data). Activation/upgrade (up to $45), early termination (up to $325) and other fees, charges & restr’s apply. See a store for details. 9Avail. at select locations. Wireless service is required on both devices. Activation/upgrade, early termination & other fees, charges & restr’s apply. Subject to change. See store for details.